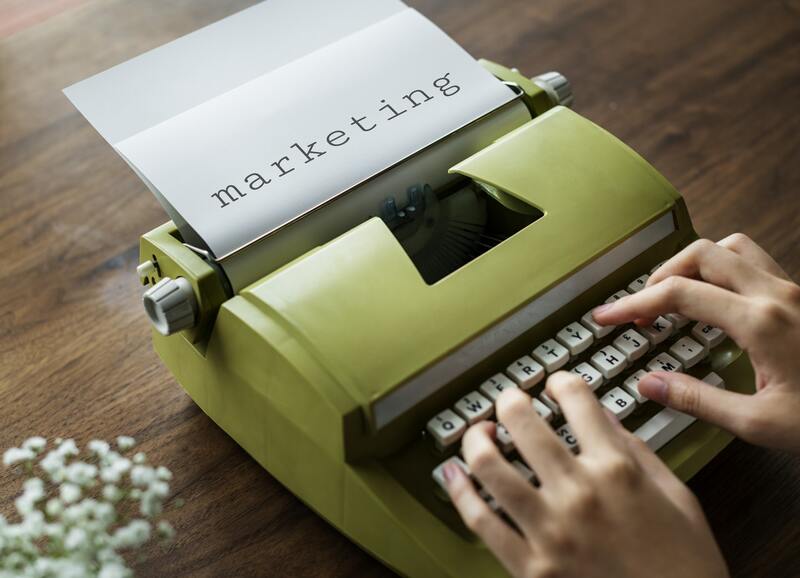 There are so many ways to market your content, platform, brand and products: from getting existing customers to buy more and paid social media advertising to guest posting and introducing a new product. The daily tasks of a digital marketer never end and new trends are evolving every new year that allow you to promote your company and services in even more effective and innovative ways. However, there are also some less popular but equally effective and profitable techniques. One thing you might not have thought of is Quora – the question-and-answer site with 200 million monthly unique visitors. 1. Quora is great for branding. For a start, Quora.com can help you with brand exposure. The more places your brand name appears on, the more you increase your brand awareness. What’s more, on Quora you can provide value and let people connect it with your business. By replying to questions with long and informative answers and contributing unique insights, you can gain attention and use it to build your brand. 2. Links from Quora bring traffic to your site. Who doesn’t want more backlinks that bring new visitors to their platform? While the links you include in your answers on Quora are nofollow, each can still produce many clicks. Some answers can also rank high for search queries, which means people will read your reply and head to your site to learn more. *note: links from Quora are nofollow but in my opinion nofollow is still affecting the ranking. And not only in my opinion. 3. Top experts use it. Many of the top digital marketers write on Quora too. So being there might be a great way to connect with influencers. This shows that Quora is great to position yourself as an expert in your industry. So go ahead and create your profile, add information about yourself and your business, and start sharing and gaining knowledge. 4. Your content from Quora can get picked by Forbes. Did you know that by answering questions on sites like Quora you can get picked by some of the top publications on the Web? 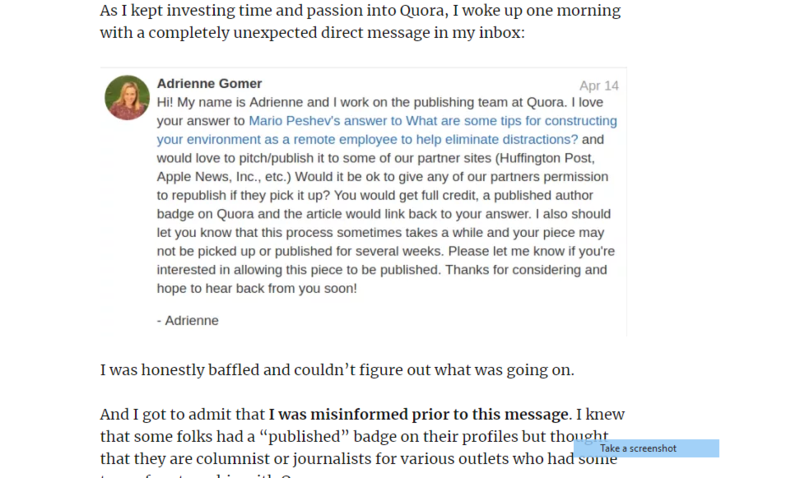 That happens all the time as long as you’re an active Quora user and are truly contributing to the platform and community with your replies. Let’s take Mario Peshev from DevriX as an example. He woke up one morning and saw that he was contacted by the Quora staff. They picked his content and asked him to republish it on other platforms. Mario’s answers got republished on sites like Forbes, Huff Post, Inc, Slate, Apple News, Hackernoon and many others. Up to now he got 24 of his answers republished and gained more than 30 links! You can see how he got started with Quora and was published on big publications in this article. Another way to use Quora in your marketing strategy is as a place to get content ideas. Just by exploring the questions on the site, you can come up with many ideas for your next articles or other pieces of content. The countless topics covered there in the form of answers, together with the wide variety of opinions shared by people from all fields, can give you enough data on what’s trending, and also let you know what people want to read more about. You can then add these ideas to your content calendar and cover them on your blog. Finding hidden gems might take some time. So be ready to first become part of the community and learn how the site works exactly before you begin stumbling upon interesting topics you want to write about and share with your audience. Another great thing about Quora is that all kinds of experts are there and they too add their opinion on important topics. That can help you make a list of all the points you should discuss in order to create cornerstone content, for example. 6. Get to know your audience by engaging with them on Quora. As a marketer, you should never get tired of finding new ways to engage with your audience. A place like Quora can do a lot for your relationships with your readers and customers. 7. Quora lets you stay on top of trends. Last but not least, Quora can be used as a way to stay up to date with anything going on in your field. With all the topics covered there and the experts and influencers from different industries sharing their insights, you can be one of the first ones to know when something that concerns your business or audience is happening. For that, you will need to make Quora a daily task on your list of business activities. The platform is easy to use and can feel like a search engine or a social media website depending on the way you’re using its features. But as long as you’re always there, asking question and answering, connecting with people and keeping in touch with your audience, you can be sure that your business won’t fall behind your competitors. The thing that makes Quora a strategy that takes more effort is that you need to actually be on it a few times a week and answer questions. Each must be informative, well-structured and relevant. You might not see immediate interest in your content, but over time you will build your reputation and it will turn into traffic to your site. Be patient and play the long game. Quora will pay off in multiple ways and might become your marketing technique with the best ROI.